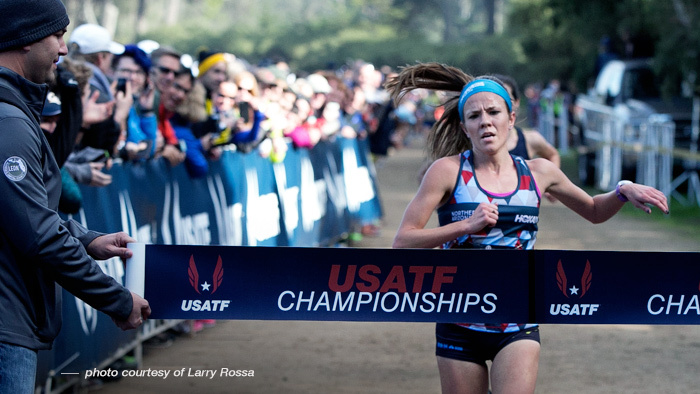 On Saturday, December 12th, Amy Van Alstine won her second National Cross Country Title. Her first, with a 22-second margin of victory, came at the USATF Cross Country Championships in Boulder in February of 2014. This one, at the 2015 USATF Club Championships in San Francisco, was much closer. Amy battled stride-for-stride in the final 1,000 meters with teammate Rochelle Kanuho and Boulder Track Club’s Laura Thweatt until she finally pulled out a 1-second win in the last 20 meters. As a coach, winning never gets old. I was just as excited for this one as I was the first time around. In fact, probably more so. For one thing, I had only been working with Amy for eight weeks when she won in Boulder. I know her much better now and I also know the trials and tribulations she’s had since that first title. Injuries, some big and some small, have held her back from the trajectory she was on in 2014. Even this fall has had its problems. Though she is not one to make excuses, I’ll go ahead and tell you that issues outside of her control had been the cause of sub-par results in her last two races coming into the Club Championships. Those results left her a bit down mentally, not necessarily where you want to be heading into a National Championship. As her win reveals, Amy was able to throw all those negative thoughts out the window once the gun went off. If you take nothing else from this post, remember that belief in yourself on race day, no matter the circumstances, is a vital part of any truly great performance. I wanted to give you that background before diving into the data analysis because I believe that understanding an athlete’s mental state is an important piece of that analytical process. Not only can it help us understand how an athlete performed on the day, but we can then use the physical data, good or bad, to our advantage moving forward. In this case, Amy and I now have concrete data that shows how fast she can run, even after a difficult stretch of training and racing. We know that as long as she’s healthy she’s at least capable of going out and running 5:20 per mile pace on a hard 6k cross country course. View Van Alstine’s full file. 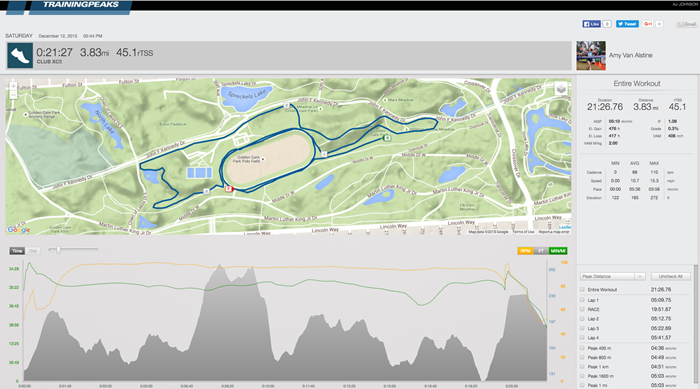 Below is a pretty simple, but cool, feature to use on TrainingPeaks- segment highlighting. On any file, coaches can click anywhere on the data and highlight specific portions of a race or training session. In this case, I’ve highlighted (in light blue) Amy’s first minute of the race. Within that highlighted section I like to look at the green line that tracks speed. You can hover over any spot on that line to see exactly how fast an athlete was moving at any one particular moment. I wanted to show you that 30 seconds into the race, Amy was running very hard, at a 4:18 per mile pace. That may seem crazy but you have to understand the nature of a cross country race. With 346 athletes on the starting line, Amy and the other top athletes had to get out hard to establish their position up front so as not to risk being stuck behind a mass of runners. Just one minute later though, she had already settled in and had slowed to a 5:22 per mile pace. She ended up crossing the actual mile mark in 5:09.75, but you have to remember how fast the start was. I think a lot of times athletes get scared when they see the first mile split in a cross country race because it seems too fast. But do the math. 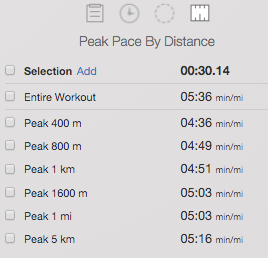 Another cool feature on TrainingPeaks is looking up an athlete’s fastest peak pace. Amy’s fastest one minute of the entire race was from eight seconds into the race to one minute and eight seconds into the race. So even though she hit the mile at 5:09, which is a pretty quick split, a big reason for that was that the first minute or so was so fast. And you have a lot of adrenaline in that first minute. A fit athlete can get out hard like that, then back off and recover, with little or no negative effect for the rest of the race. The key there is the back off and recover part. Amy did an awesome job of that. The last part of the race was awesome. I was standing at the bottom of a fairly short, but very steep hill that the athletes had to climb before making their way onto the Polo Fields, a famous section of the course home to all sorts of athletic events since 1906. Before the hill the athletes had to traverse a section of wooded, single-track trails where they were essentially hidden from the crowd. So I had no idea how Amy and Rochelle had fared since I last saw them about a half mile earlier. At that point Amy had been right in front with Laura Thweatt, but Rochelle was a few seconds back. To my surprise when they popped out of the woods they were both right there. I was going crazy! But to win a close race takes a big finish. We all know that. I quickly ran to the top of the curve with about 400 meters to go. They were still all three right together. From there the crowd was too big and even though I sprinted as hard as I could I wasn’t able to see the finish. I did hear the announcer yelling Amy’s name as she crossed the line though. Total goose bumps. So what had happened over that last quarter mile? Luckily, I can go into Amy’s TrainingPeaks file and find out. As it turns out, while her fastest one minute section of the race was basically the first minute, her fastest full 400 meters was her last. She ran that last 400 in 69 seconds, the equivalent of a 4:36 per mile pace. That’s pretty darn fast on the dirt at the end of a grueling cross country race.